There is one fact that is overlooked when dealing with the history of Yosemite, and that is the direct involvement of Indian miners around Yosemite. Many people don't like to mention it when looking at the early Native American history of California, especially when talking about Yosemite. Many historians tend to skip over this part because it does not fit into their idea of the Gold Rush. 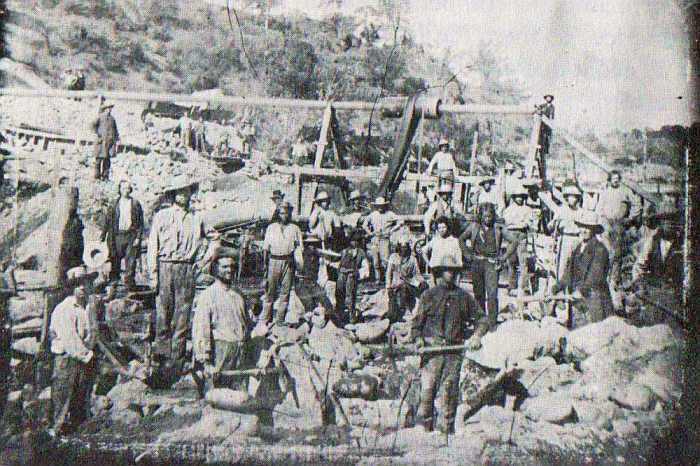 The fact that there were Indians who worked side by side with the white miners. It is a fact that Charles Weber, the founder of the now bankrupt city of Stockton, California, was good friend of the Central Valley Indians. When gold was discovered in the late 1840s Weber was one of the 1st men to contact his Indian friends living in the San Joaquin valley floor to work for him. Weber made an agreement with several early Sacramento and Stanislaus county Indians to work for him digging the newly discovered gold in exchange for payment of provisions for them. He contacted the chief of the Indians living around Knight's Ferry and he agreed to let his people move up to the foothills to dig golf for him. Weber was only one of a few men who did this, another one was the underhanded scrupulous James Savage, the "blonde king" of the Mariposa Indians. Not only did he make agreements with several chiefs, including the Yokut chiefs Chowchitty, Ponwatches, and Miwok chief Bautista, but also several other Indian chiefs of the western foothills. Savage became their 'king', protector and main benifictor. The chiefs even offered Savage several girls from their tribes as tribute. They really worked hard for Savage, but when it came to the payoff Savage cheated them, and instead of supplying them with provisions he blew the money on himself in a drunken spectacle in San Francisco. That temporarily got his allies, the Indian gold "Diggers" really upset and that is when his trading post close by the mouth of Yosemite was attacked. Some people say it was Chief Tenaya and his band of a Ahwahneechees, but Tenaya himself said that it was Savage's own gold mining "friendly" Indians who did that in retaliation for what they saw as bad treatment. This is how Yosemite was "discovered". Savage's own Indian brother-in-laws, Cowchitty and Ponwatches, had turned against him and that is how the Mariposa Battalion was created to track down the Indians who had burned his trading post and killed his white workers. Yes, Savage, still had loyal Indian miners, but some had turned against him and they were to be brought back, punished or be brought back into the fold. Cowchitty and Ponwacthes chose the later when the Mariposa Battalion entered their village in early 1851. Then days later they went after Chief Tenaya who said he had not been involved in all the foolishness of digging gold for the whites in favor for trinkets and red scarves. Tenaya, the founder of the Paiute Colony of Ahwahnee, was his own man and he and his people were not involved with the whites on the western side, but he had bore the blunt of harshness cast upon him and his people for not being one of Savage's mining Indian chiefs and Indian gold "Diggers".